Crowds of Parachicos in colourful robes, masks and yellow Monterras (hats) make their way through the streets of Chiapa De Corzo during the Festival of San Antonio Abad. Part of Fiesta De Enero. Parachicos walk the streets of Chiapa De Corzo. their costume represents a combination of Pre-Hispanic, agricultural, colonial and catholic iconography. The bright yellow Monterra (hat) is a representation of the sunrise and the light of life, the mask a symbol of Spanish colonialism and the introduction of Christianity in the region. the colourful garments are traditional to the Chiapas region. 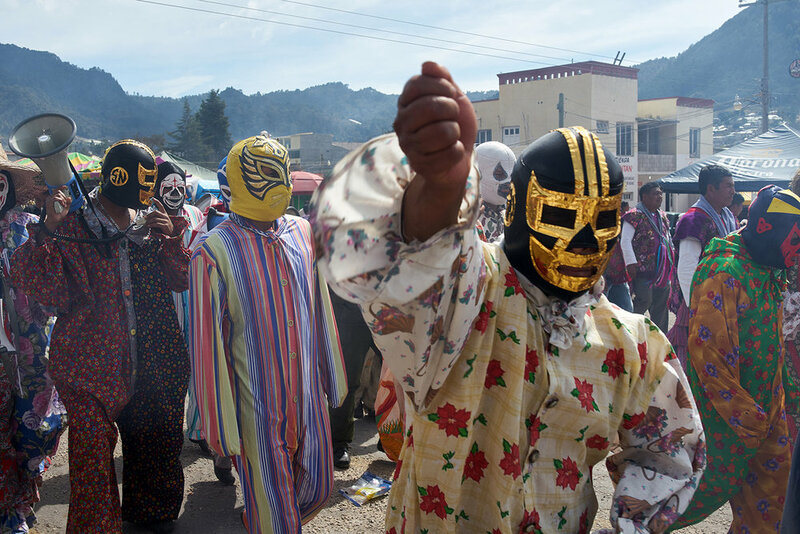 Tzotzil men from Zinacantan dressed up as a cross between a clown and a Luchador arrive in San Sebastian Plaza to perform the Torritos routine. a tradition widespread in different forms through out all of Mexico. In Chiapas the routine holds no ritualistic or religious meaning and is mostly just a form of entertainment for families and children. Local woman stands in her living room after masses of Parachicos entered her house during the festival of Senor Esquipulas. the Parachicos represent the blessings of the saints during the festival. select members of the community open their homes to the saints for the coming year. It is an honour for them to welcome the saints and they expect good tidings to be bestowed upon them. Fiesta De Enero. Chiapa De Corzo. Man lights fireworks ahead of a procession for San Antonio Abad, During Fiesta De Enero in Chiapa De Corzo, Chiapas, Mexico. Religious iconography adorns the trousers of a young Parachico. Tzotzil women line the edge of San Sebastian Plaza during the Festival of San Sebastian in Zinacantan. A Tzotzil family pray in the Iglesia De San Sebastian, in Zinacantan. Religious activity in many of Chiapas' communities is a combination of indigenous tradition and more recent catholicism. many of the churches in indigenous regions do not have priests. so, worshippers create their own prayers and recite them directly to the saints. families will often ask local holy people to create prayers for them for a variety of reasons, illness, addiction, or good luck for the start of the new agricultural year. Tzotzil men in Zinacantan perform the ritual of the Jaguar Tree. The ritual is intended to bring good luck for the start of the new agricultural year. Men dressed as jaguars climb to the top of the tree whilst others dressed as monkeys throw dead squirrels at them from below. the Jaguars attempt to catch the squirrels and place them in a cage mounted on their back. once the squirrel is caged the Jaguars throw sweets down to the local children. Tzotzil children watch the Jaguar tree tradition during San Sebastian day celebrations during Fiesta De Enero in Zinacantan. woman in brightly coloured traditional dress on the streets of Chiapa De Corzo during the Festival of Senor Esquipulas. The ritual of Parachicos dates back to a time when a woman came to Chiapa De Corzo from the old Chiapas capital Antigua (now part of Guatemala.) She sought help for her sick child. and heard there was a healing spring in the area. Local shamans told her to take her son to the springs for 9 days. During this time the Parachicos danced for the child to lift his spirits. After treatment the boy was healed. it is believed that the combination of healing springs and Parachicos dancing cured him. Family stand in their living room after Parachicos come in to bless their home. The elaborate and colourful dresses worn by the women during the festival are seen as a modern representation of the State of Chiapas. they are a merging of indigenous and Spanish cultures. Dresses for the festivities can cost as much as $500usd. Tzotzil men dressed as monkeys during the Jaguar tree ritual. Zinacantan. Man dressed as a luchador takes part in the torritos (Fireworks) tradition in Plaza De San Sebastian, Zinacantan. Man dressed as a luchador takes part in the torritos tradition in Plaza De San Sebastian, Zinacantan. Statues of Parachicos and Chiapanecas on sale in the central market of Chiapa De Corzo. Young girl in elegant traditional clothing dances during a procession for San Antonio Abad. part of Fiesta De Enero in Chiapa De Corzo, Mexico. A Parachico stands in doorway of colourful building during the procession for Senor Esquipulas. Traditionally the clothing in the region was a single colour. flowers were then introduced to represent the primary industry of Zinacantan which is flower production. the small community generates between thirty and forty million US dollars annually from flower production and export. A Statue of a Prachico situated at the entrance to Chiapa De Corzo town. Picture of a deceased family member sits atop a shrine in a living room during the Festival of Senor Esquipulas. family members will light a candle for their lost loved ones in order to both be close to them and to give blessings to them in the afterlife.. Elderly woman in traditional clothing dances during the procession for Senor Esquipulas. Parachicos dance in one of the many homes designated to house the saints for the coming year. women wearing the traditional dress of Chiapas.